GeoRanker team is proud to announce Google Images rank tracking. Have you ever taught about bringing quality traffic to your website via Google Image Search? Did you know you can do this by optimizing your images? There are billions of searches done every day on Google Images. Of course, you can see some images are shown before others and the reason it’s quite simple: the first ones are better optimized than the others. Do you browse Google Images from time to time? The images process optimization for Google Image Search is quite simple and you will definitely see an increase in your traffic if you will follow the right steps. Let me guide you through the process! If you want to learn more about on-page SEO, we already wrote a comprehensive research. Before the factor listing, the image value comes from its relevance – Google will never display content that is irrelevant to user on top positions. The images should be relevant for the searches, so if you try to get quality traffic, your image has to send a proper message. For eCommerce stores, it’s easier, the image should illustrate what it is, but if businesses like law offices or car services want to get traffic from Google Images, their image should express “1000 words”; the image itself is the title, the message sent by a business to its potential customers, it must say “hello, welcome in”. There’s no more theory for this message. Google has strict policy regarding uniqueness of content. You have to use unique images if you want to rank on google images and also to own the copyright of that image. Stock images can get you rankings, but they might not send the message you want. So it’s best to create your own content and share it on web. Use Descriptive Image names. The filename is the first chance to include keywords in your images. Title the image name with a keyword or short text including the keyword which describes what is in the image about. 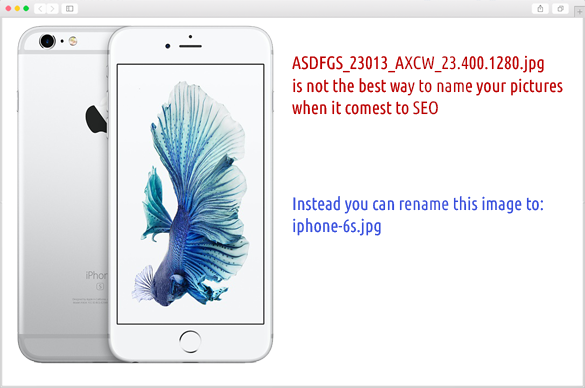 For example, instead of using a camera image name such as DSC32303.jpg, use a filename like google-images-rank-tracking.jpg. This should be the most search engine friendly way of labeling images. The alt tag is basically the description of your picture. It will allow you to add more keywords in your image description. Additionally, the alt tag is going to be shown by Google Image Search in place of the image name. Therefore, make sure to set the alt tag in combination with your image name. 4. Use images in your XML sitemaps for better indexation of your images. The best way to help search engines indexing and finding your images is listing them in your sitemap, more exactly in an image sitemap. This will increase the exposure of your images so they could be found in an image search. If you build an image sitemap, search engines will be able to crawl and organize your images. Start doing it following these guidelines about image sitemaps. Fast site speed is one of the conditions you have to fulfill if you wish to rank an image. All images should be in .jpg, .png or .svg format and their size is an important factor that affects directly the website loading time. Reduce the file size, but watch out as it will affect the image quality. Once the optimization is done you will need a system to start tracking the results. How to check your position on Google Images? GeoRanker Google Images rank tracking software allows users to view their images on Google from both local and generic perspectives. Basically, our platform uses the same technology as for the keyword rank tracking tool, applied for Google image search. Log into your GeoRanker account. Once you access profile, click on Rank Tracker, select Countries or Cities (this feature is pretty great as it’s based on location) and you’ll and you’ll see a new search engine in the advanced options tab. Although there is a number of options, the menu is rather open and simplistic. The images report is generated as easy as the normal reporting. Just make sure to save after you apply filters! In case you need to see only the SERPs data from Google Images, without tracking the rankings, you can use GeoRanker First Page tool. Why tracking Google Images with GeoRanker is important? Low hanging fruits are easy to get, right? As an example, plenty eCommerce stores are getting quality traffic from Google Images searches. Besides this fact, optimizing their images is helping eCommerces store rank higher in organic searches as a whole and as such, it is in the center of attention for many companies. So for getting the most out of this eCommerce newest trend, track your product images rankings on Google images, run an image optimization campaign and boost your incoming online traffic. Pictures traffic has a much higher conversion rate than the organic traffic and can directly impact the revenue. Please note that a well-made photo can be one of the best digital resources at your disposal. Not only does it provide information about a product but it also works as a key selling point. With the latest version of GeoRanker Google Images rank tracking tool, you are able to find and monitor the SERPs for individual keywords you target Google image search on different domains and overall benefit from all the points above. When it comes to image trackers with wide application, GeoRanker is at the top of the list. It is developed with user in mind giving you full control. If you choose so, you can get a demo without having to download software to your computer. GeoRanker will also work within any browser!